All of us have come across articles like “How to impress a woman (or man, but yeah mostly these articles are about impressing women) on a first date?”, “How to succeed in an interview?”, “How to be popular at work?” and “How to make a successful presentation?” One may have noticed that most of these articles suggest “have a sense of humour”. Uh – huh... so you go ahead and prepare a joke or two before you go about with these social happenings and feel glad you did so. But, you are awfully surprised when your joke misfires and feel awful about it for a long, long time.That does sound familiar, doesn’t it? This hardly happens with me. Almost never one can say. True story. As I have learnt from my mistakes and don’t repeat them. I get shocked to see so many people around me who totally miss this and just don’t get it even after experiencing these rebounds again and again. 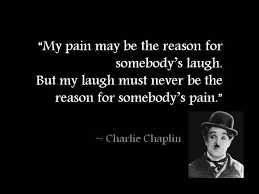 The great actor, comedian, director and scriptwriter Charlie Chaplin understood pain or tragedy like no one did, hence he made comedy around his own character, the tramp, in his movies. 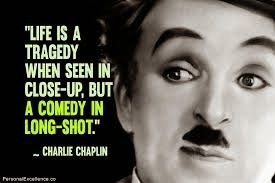 Even today his comedies touch your heart and make you feel both pain and happiness simultaneously. Some people indeed have a great sense of humour. When everyone in the room you are in actually like your joke and you are able to make out whether the laughter was real or forced then you have said a good joke and have a sense of humour. It’s OK to make a mistake while experimenting with humour, but you need “sense” as well, that’s exactly why the phrase is called “sense of humour” or it would have simply been “humour”. Bottom line is that you need to learn from your mistakes; not suggest that your audience also lowers their sensibilities and laugh at a bad joke. A joke could be funny, dirty, and even bitter-sweet. But if you don’t know how to say it and when to say it, you are doomed. If you have an audience, well, let me not get into that. But I like Shah Rukh Khan’s sense of humour. He makes fun of himself first hence its easier for people to be more receptive towards his jokes. Women like his jokes as he makes fun of only those things which he knows the woman in question is fine and comfortable with. In short, he knows what he’s talking about, and very well. You can get it right too; all you need to do is be a little thoughtful. Ask the woman as candidly as you can that you are planning that joke and if she is OK with it before saying it out loud. Yes, many thriving people do that, no kidding. I like Russel Peters too, but I also have a taste for other people who are a little subtle. I like Comedy Nights too and enjoy the show, but I also know why it works with the audience. If you start joking like the very talented Mr. Kapil Sharma, all you would get is disdainful looks and you would most certainly get into fights. However, some people don’t understand that. Asking her to eat and when she doesn’t, telling her “Come on, eat some more, you won’t put on weight” Haha! Seriously? Well this will most certainly put her on a different track and she won’t eat even if she was planning to. Making fun of anything related to her physical appearance... trust me, only the TV show people can get away with that. And we all see reports when they also get in trouble. Making fun of him in front of friends about something he is sensitive about. Laughing like a hyena even when something he said wasn’t funny at all; men hate that. Just as the women appreciate a man who knows when to say what, men appreciate a woman who knows when to laugh and when not to laugh. Making fun of their kid’s intellect in front of relatives or friends. Making fun of them for being overweight, performing badly at school or the way they talk. Bosses making fun of their employees instead of motivating them. Employees making fun of their bosses when their unreasonable demands are not fulfilled. 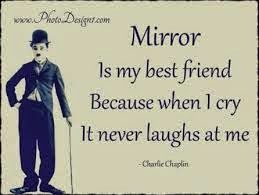 Sense of humour is a wonderful gift to the ‘gift of communication’ to human beings. It can get a lot done if used properly and effectively. Sadly, most people need to learn sense of proportion before they develop a sense of humour. A table without legs goes flat, just like a bad joke. I felt bad hearing about the AIB controversy. Some people are saying that we should concentrate on other things which are really important, but I feel if we don’t change the way we say a joke, it will affect society at large. If we are that careless about sense of humour, subsequently people will take all serious issues like a joke and it will most certainly lead to crimes; people will not be responsible for their actions. Protesting for a good movie to be shown without cuts is a different thing and deliberately hurting sensibilities in comedy shows is another. One can’t compare the two. Saw a nice movie about revenge last night, Badlapur. It’s dark and some scenes are little crude, but works due to the overall storytelling. Same applies to jokes. I appreciate all different jokes, but there is a big difference between a good and a bad joke. This proverb has been used in Badlapur, but I am using it in a different context here. If you make a joke, you should know that you might forget it but the person who was hurt due to it would always remember it. I am sensitive and I thank God for it, as it has made me understand a lot more in life. Hope more people become understanding as that would make the world a better place to live. Nice blog, please check mine as well. U really brought "sense" to people by this 'sense of humour' article!...really well combined the thoughts and instances! !